Justin Kurzel’s adaptation of William Shakespeare’s seminal tragedy Macbeth is rapturously shot, compellingly stark, and acted with a visceral and earthy tone, redolent of partial immersion in the uncomfortably moist sensation of a dangerous bog. Shot by white-hot young DP Adam Arkapaw (True Detective, Top of the Lake), this might be the most astoundingly gorgeous screen version of this weird and ugly play ever made. Sweeping wide shots of majestically craggy Scottish landscapes alternate with smoky battles and annunciations punctuated by artfully elongated drips of blood and saliva. Stone castles and cathedrals give way to foggy heaths and fields suffused in reds and golds, crepuscularly brushed with weak northern sunrays. This is a thoroughly ravishing Macbeth that nonetheless never forgets to be the dirty, nasty, mud-splattered slaughterhouse that it must be as well. Kurzel and Arkapaw serve notice very quickly of their visual and dramatic approach to the material with a stunning battle sequence that manipulates the space and time within the frame with magnificent aesthetic effect. Impressive camerawork and editing is said to render violence as beauty far more often than it actually manages to do onscreen, but this scene is truly war as art, a sublime slaughter that is no less terrible for its beauty. It demonstrates the exquisite balance and rugged abandon in equal measure, and it sets a definite tone for all that is to come. What is to come is the familiar narrative of prediction, murder, usurpation, and inevitable downfall, but grounded in a parochial medieval context of maximum brutality. The Shakespearean text is treating not as reverently-approached holy writ to be recited verbatim in complete but as source material for dialogue, a storehouse of finely-crafted word-tools with specific functions, like a thrusting sword or a household prayer icon. 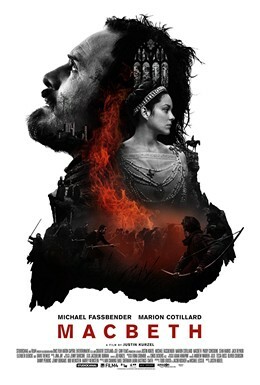 The performances, especially from Michael Fassbender as Macbeth and Marion Cotillard as Lady Macbeth, are strong indeed, but occupy the position of subordinate parts to a greater vision on greater themes. Showboating, such a tempting thespianic vice in the face of such florid language and richly sweeping tragedy, is a kept at a minimum, as is any sneaking lining of dark humour (Macbeth’s unhinged behaviour when faced with a ghostly visitor at a packed banquet offers no respite of laughs, as it sometimes does in other versions). The problem with crafting a screen Macbeth that is this stoically convincing and fundamentally self-serious is that the Scottish Play is loaded with elements that put a great strain on modern audience’s suspension of disbelief. Cackling witches stirring cauldrons and telling vague fortunes, spectral visions of dead men and floating daggers, and a climactic double-shot of deflating prophecy. One could argue that Macbeth‘s weird (wyrd?) characteristics deepen and peculiarize the grand tragic themes of ambition, lust for power, and moral descent, but one could just as easily argue that they detract from those themes. This text may be central to the English literary canon but it’s a bit silly sometimes, innit? Kurzel, working from a screenplay by Jacob Koskoff, Michael Lesslie and Todd Louiso, deals with Macbeth‘s hoary supernatural elements and prophetic resolution cheats by normalizing them, rooting them in a sense of physical and psychological reality. Rather than haunting Fassbender’s Macbeth solely with by shaken bloody locks of the ghost of Banquo (Paddy Considine), the thane confrère that he has unceremoniously whacked in a mad effort to safeguard his potential dynasty, the blood-soaked Scottish king and his power-hungry Lady are beset by any number of unsettling apparations giving spectral form to their regrets, crimes, and desires. A dead Macbeth child opens the film and later reappears at the conclusion of Lady Macbeth’s “out damned spot” monologue in an abandoned country chapel, prefacing the subsequent horrors committed by its grasping parents in a crushing grief. The early battle won for King Duncan (David Thewlis) by Macbeth and his cohort includes numerous slain boy soldiers, one of which re-appears later to remind Macbeth that the depth of his moral guilt infects even his great deeds, holding the ghostly dagger that he sees before him. Even the witches drop in for visits at key moments in the final act tragedy, one of them holding the swaddled infant that the Macbeths have lost along with their moral compass. The film’s resonant treatment of at least one of the many prophecies that the witches pronounce upon Macbeth rescues it from a costly last-act deflation. Many an imaginative reader, most notably a young J.R.R. Tolkien, was filled with excited anticipation at the prophecies that Macbeth would not fall until the forest of Birnam Wood comes to his castle of Dunsinane and that he could not be killed by any man of woman born, only to be disappointed by the fulfillment of these predictions by soldiers with branches in their caps and Mama Macduff’s C-section. Kurzel doesn’t deal with this potential pitfall with Tolkien’s spectacular one-up-manship, true, but his solution is perhaps more elegant: Malcolm’s army burns the wood, the embers drifting up to Macbeth on the ramparts and the flames’ red glow providing the backdrop for the final dust-up between Macbeth and Macduff (Sean Harris), during which Macduff’s “untimely ripped” line lands like a vicious battlefield taunt. Whatever the how and the why, Justin Kurzel’s Macbeth is a tremendous aesthetic experience. Had I managed to see the film prior to the end of last year, it would certainly have found a spot high in my list of 2015’s best cinematic offerings. How it rates in relation to four centuries of adaptations of the Scottish Play, I am certainly not qualified to comment upon. But it distills influences, fashions, and aesthetic textures both historical and contemporary into a heady brew of a drama that will not soon fade, a film full of sound and fury that signifies very much indeed.